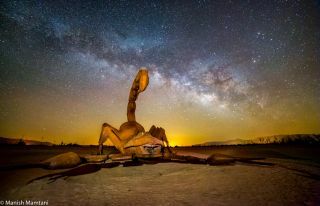 A giant scorpion appears to be striking the Milky Way with its tail in this stunning image taken by skywatcher Manish Mamtani at Borrego Springs, California on April 17-19, 2015. A giant scorpion appears to be striking the Milky Way with its tail in this stunning image taken by a veteran night sky photographer. Photographer Manish Mamtani took the image in Borrego Springs, California during the weekend of April 17 to 19. The scorpion shown here is one of several large iron sculptures by Ricardo Breceda found in Borrego Valley. Mamtani also captured images of the Milky Way with giant dinosaur statues, as well as prancing rams. Mamtani also posed for an epic selfie with the silhouette of a Breceda's dragon statue as an iron companion. In another photo, The headlights of a jeep appear to shine across the Milky Way and out into deep space. The Milky Way is a barred spiral galaxy stretching between 100,000 to 120,000 light-years in diameter. It comprises gas, dust and roughly 400 billion stars. The portion of the galaxy we see is the center of the galaxy, as seen from one of its outer arms. A light-year is the distance light travels in one year, or about 6 trillion miles (10 trillion kilometers). You can see more of Mamtani's spectacular photographer on his Facebook page. Editor's note: If you have an amazing night sky photo you'd like to share for a possible story or image gallery, send images and comments in to: spacephotos@space.com.